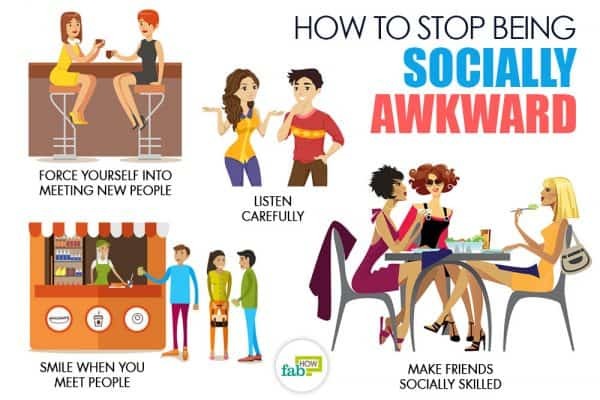 Some of the characteristics of being social awkward include feeling shy, getting anxious and insecure around people, feelings of social inadequacies, and the inability to be good at conversations. It is a condition that millions of people struggle with. Often people suffer in silence as they think there is something wrong with them. When you start thinking of yourself as awkward, it can undermine your social confidence. You start dreading social interactions, and it destroys your ability to lead a healthy social life. Never allow your social fears and anxieties to pull you down. Remember, not everyone is thinking about you. When you think that everybody is watching you and scrutinizing you, it makes you feel nervous and self-conscious. Know that people are busy and almost everybody is bothered about their own struggles in life. Once you realize this, you will be able to mingle freely and happily with people. 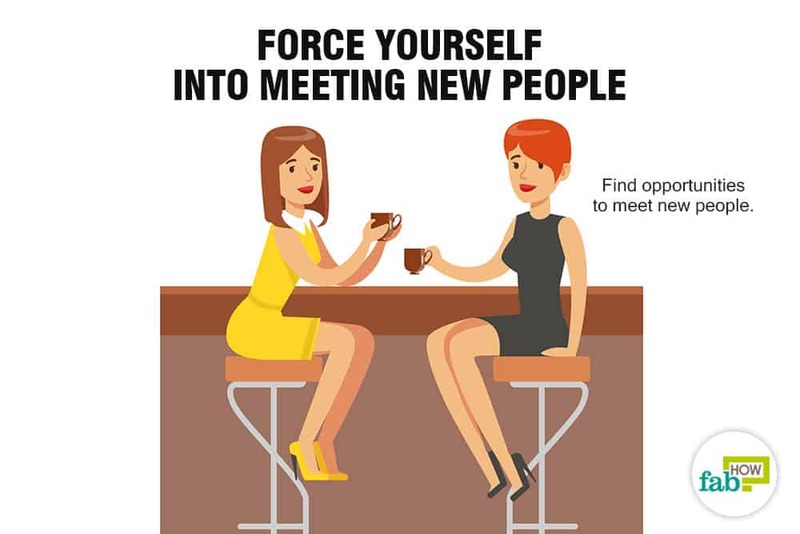 Force yourself to meet new people. Make an effort to be more outgoing. Get out of your house and consciously put yourself into social situations. Find opportunities to meet new people. Get enrolled in a hobby class, join a club or group, or simply try talking to the bartender or your barista. Make conversations, experiment, notice the results and fine-tune your behavior accordingly. In time, you will develop your social confidence. Try to hold conversations as often as possible. Do you often become anxious and nervous in unfamiliar situations? If you answered yes to this question, then you need to practice conversing with people as much as possible. When you talk to people in person, you start developing a sense of what you should say next. Over time, it will come naturally to you. Try to have polite conversations with unfamiliar people. Whenever you are in unfamiliar surroundings like conferences, parties, weddings, try to hold conversations with people. Strike up a conversation with someone who is sitting idle and alone. Smile when you meet people. Smile at people in public places. 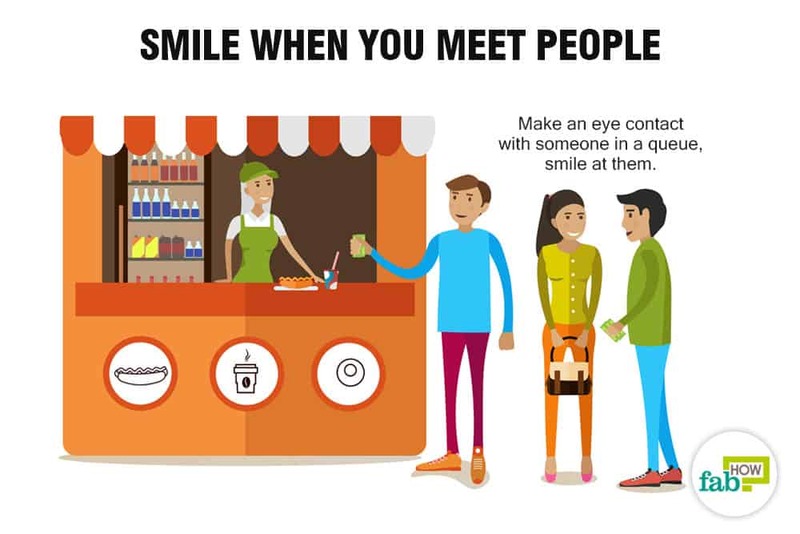 When you meet someone in a store or make eye contact with someone in a queue, smile at them. Smiling reduces your social awkwardness. While meeting someone new, smiling will help you put others at ease so that they are more comfortable in your company. When you see others at ease around you, it will boost your self-confidence and self-esteem. Shake hands firmly. 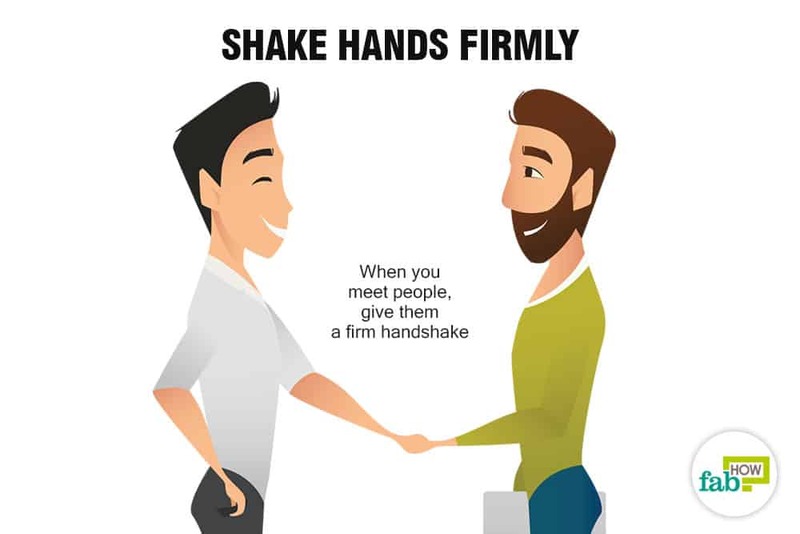 When you meet people, give them a firm handshake. When meeting someone new, grip that person’s hand firmly and confidently. Just make sure not to crush the person’s hand and avoid holding on for too long. Sweaty palms and a weak grip send awkward signals, whereas a cool and firm grip indicates confidence. Avoid hugs or handshakes if you are not sure. If you think you have bad timing when giving a handshake, high five or a hug while greeting someone, avoid it completely. It can be embarrassing and uncomfortable to be rejected when you offer a hug or a handshake. Be early. Make sure to arrive early at an event. When you arrive late to an event, it’s usually a struggle to catch up with people or get acquainted as everybody already seems to know each other and people are busy in their conversations. Instead, if you arrive early or are the first one to reach the place, you get a chance to mingle with everyone there. Exude confidence in your body language. When you feel socially awkward, you tend to collapse into yourself, slouch, get fidgety and start clenching your fists. Instead, try to stand or sit straight, smile and nod while listening. This shows that you are interested and happy to be there with the person. When you act confident and social, you end up feeling confident. Make eye contact while talking. 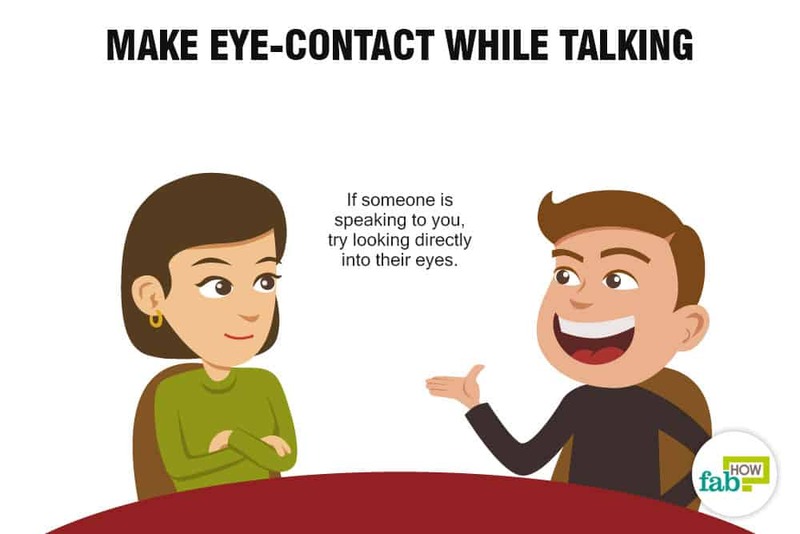 When you are talking to someone or if someone is speaking to you, try looking directly into their eyes. Make sure not to stare at them, but look at them as if you are genuinely interested in them. On the contrary, when you look away, it indicates disinterest and boredom. Improve your non-verbal skills. The success of any conversation depends on how you say things rather than what you say. Try to be polite while talking to people. Don’t make the conversation all about you. Don’t take over the conversation. Act according to the situation. If you are in a casual setup with friends and family, be relaxed and playful, whereas when in a formal situation, be attentive and act in a matured manner. Be present in the moment. While talking to someone, if you feel anxious, nervous, tense, insecure inside, they will notice it. You need to be happy and relaxed on the inside if you want to give out positive vibes. If you feel sad from inside and you try to portray being happy, people will sense it. Focus on the other person. Instead of worrying about your feelings and thoughts or thinking of what should you say next, try to think about the other person, how they are feeling or getting along. This will make you focus less on yourself and divert your mind. 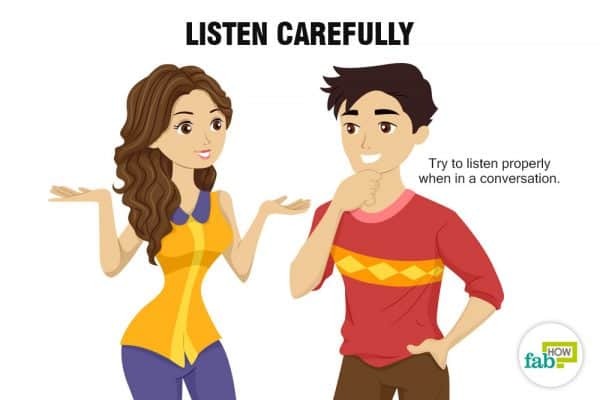 Listen carefully. Most of the time when you are talking, you are unable to read other's social cues as you may be nervous and worried about making mistakes. You are lost in your thoughts and you don’t listen to people carefully. Hence, try to listen properly when in a conversation to stop being socially awkward. Ask questions and be curious. Be curious about people. Ask questions when meeting new people. When you meet new people, think of things you would like to know about them. Is it about their kids or about their job or simply about their tattoo? Just ask those questions. When you ask questions in a conversation, you make people feel at ease. This gives you the power and control in a conversation, thereby boosting your self-confidence. Make mental notes. When in a conversation, make mental notes of things people tell you. When you make mental notes, it makes you carefully listen to the person you are talking to, and this reduces your chances of messing up or getting your social cues wrong. It also helps you become less anxious as your mind is distracted and is busy focusing on what the person is saying. Later, you can use these mental notes to keep the conversation going by asking questions related to what the person told you. If you lack a good sense of humor, avoid cracking jokes. If you are not sure about your humorous side, just stick to normal conversations, avoiding any jokes. Do not fret about awkward silences. There may be times when awkward silences arise in a conversation. An offensive or uncomfortable comment might be the reason. When this happens, don’t try to fill the silence. Let the silence prevail. Wait for a few moments, and a new topic will arise. Calm down. Learn to calm down before you get into a social situation. If you are relaxed, it will help you to open up and let you embrace social situations instead of dreading them. Try practicing meditation or deep breathing to overcome anxiety. Learn to take it lightly. Don’t beat yourself up if you act silly, fumble or do something embarrassing. When you take it lightly and laugh at yourself, you come off as a confident person. Also, laughing will help you release the tension and make you less anxious and conscious. Stop dwelling on things. Your mind has this habit of dwelling on your mistakes. You tend to go over and over about your embarrassing encounters. When this happens, you tend to feel more awkward. When you find yourself doing this, shout "stop" internally. This will enable your mind to refocus on the present situation. Do this several times, and with practice, you will get over this habit of over-dwelling on things. Learn to let it go. Worry less about others’ opinions. Try not to bother yourself with other's opinions. If you anticipate other people’s judgment and opinions in advance, you will get nervous and worried when the actual situation arises. Use self-talk. Self-talk will help you shift your focus from negative thoughts and feelings to positive ones. When you feel anxious in social situations, try telling yourself, "It will be okay, just relax and calm down." You can also say "I am going to enjoy myself and have fun." Focus on the positive side. Instead of focusing on what went wrong in the past or on one bad occasion, focus on the positives; what is going well right now in your life. Try to think of the times when you thoroughly enjoyed a social interaction to stop being socially awkward. Document your experiences. Note down your conversations in detail in your journal. Break down each conversation and evaluate how you can improve it. Write down about your conversations, where you had them when you had them and with whom, what was your body language like, as well as what were your feelings and thoughts during the conversations. Also, write down what went well and what you can do to improve it next time. Invite people to dine along with you. Meals make people come closer and help make conversations easier. In case you are dining alone, try to do it with a friend or a colleague. If you are in a social event or a formal gathering, try to find someone who is dining alone and try to strike up a conversation. 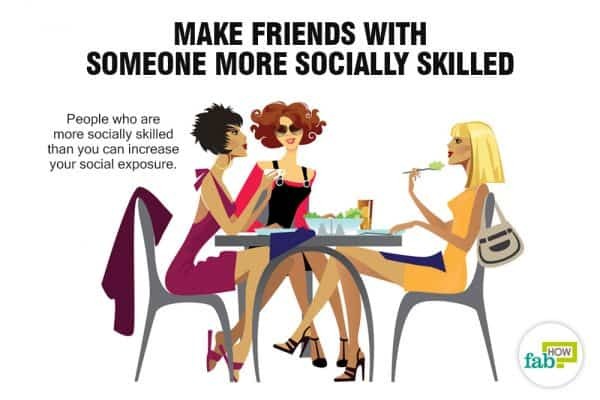 Make friends with someone more socially skilled. People who are more socially skilled than you can increase your social exposure. Become friends with such people. When you accompany them to social events, they will introduce you to new people, they will deal with the small talk, and you don’t have to do much talking. You just need to chip in when needed. The best part about hanging out with such socially active people is that you don’t have to start from scratch. Later, with practice you are comfortable with socializing with people without their support, you can start going out on your own. 1. Heimberg RG, Hofmann SG, Liebowitz MR, et al. SOCIAL ANXIETY DISORDER IN DSM‐5. The Canadian Journal of Chemical Engineering. https://onlinelibrary.wiley.com/doi/abs/10.1002/da.22231. Published January 2, 2014. Person1: hello my name is mike. Oh come on. Put some effort to it man. I also have the same tendency to quickly dismiss convos since Im very bad at social situations too but if we really want to improve our social skills we’ll have to be determined and cut the slack. It is okay to be a bit nervous while interacting with others. However, you will have to overcome your fears and start in the right direction with teeny tiny steps. It won’t be achieved overnight but gradually you will see a change in yourself with continuous efforts. I hope the tips mentioned above will help you all. Honestly it’s just about being comfortable in your own skin.. which is something that does not come easy to most people. 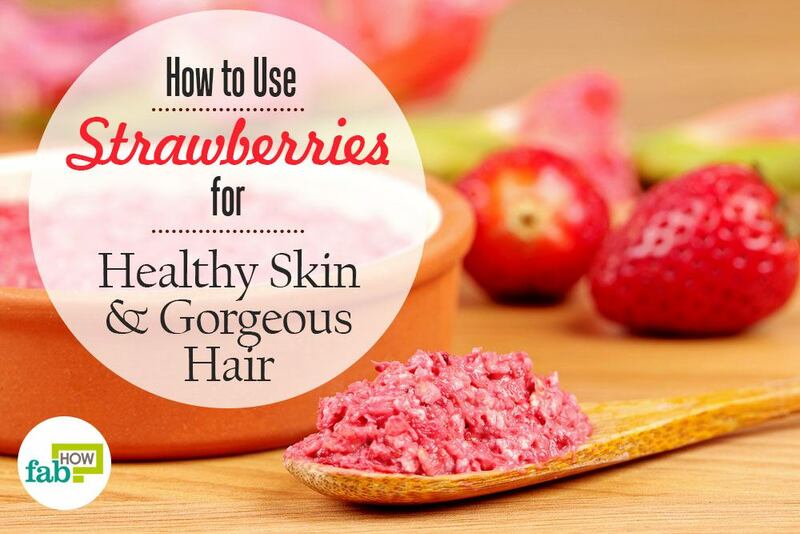 It is great to hear that you find these tips helpful. We sincerely hope that we will be able to make a slight difference to your life, and for that matter to the lives of all our readers in a positive way. Glad you liked it and we sincerely hope they help you.